Mythic dreaminess and quotidian bleakness: Anna Winter reviews Michael Keegan-Dolan’s version of Swan Lake. Swan-Lake by Michael Keegan-Dolan at Sadler’s Wells.. Photo by Colm Hogan. 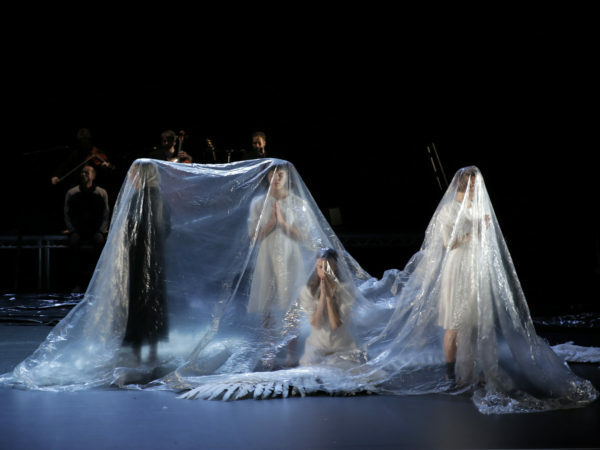 Michael Keegan-Dolan’s Swan Lake/Loch na hEala is a work of pure theatrical magic. It’s deeply sad, leavened by laconic humour, a blend of mythic dreaminess and quotidian bleakness. This Swan Lake is set in contemporary Ireland, a world in which the tracksuited protagonist’s transcendental visions of a beautiful bird-woman are undercut by religious sleaze and a local councillor chuntering about Rural Redevelopment Grants. It’s accompanied by Irish-Nordic string music performed onstage by trio Slow Moving Clouds. Instead of a prince beset by Weltschmerz with a cross-bow, we have 36 year old Jimmy O’Reilly (Alexander Leonhartsberger) – he’s a slumped and sidelined figure, clinically depressed after the death of his father, reluctant to leave the family home and move into the new council-built bungalow so prized by his wheelchair-bound mother. The latter hopes to marry her son off to a nice girl, so she organises a booze-fuelled birthday party for him and gives him the dubious gift of his late father’s shotgun. At the centre of it all is Mikel Murfi’s mercurial narrator. He begins in just a pair of underpants, tethered to a concrete block, bleating like a goat. A trio of mysterious men in dark suits and wide-brimmed hats gather, dance a loose-limbed invocation and clothe him. Soon enough he’s in compère mode, fag in hand, demanding cups of tea and snaffling up biscuits goat-style. It’s a performance of virtuosic verbal dexterity and immaculate timing – he conjures successive snatches of chatter and music as Jimmy’s mother flicks between radio stations, he plays the community’s crooked politician, policeman and priest, sometimes in rapid fire conversation with each other. It’s as the ‘Holy Man’ that he confesses to a crime and a curse that explains the presence of winged girl Finola (Rachel Poirier) down by the lake. The duets between Jimmy and Finola are wonderful to watch, twitchy fearfulness morphing into mutually supportive embraces and cradling movements. There’s fine support from Carys Staton, Molly Walker and Anna Kaszuba as Finola’s sisters, whose gently bewitching ensemble dances are marked by percussive footwork and outstretched arms. Jimmy’s party, meanwhile, has a desperate, manic energy. A plastic bag of provisions is torn apart by the revellers: cake scoffed, beer guzzled. There are high-pitched shrieks of glee when the town’s eligible women (male dancers in dresses) attempt to be alluring. Even the musicians don sad little party hats. But for all the work’s searing, suicidal bleakness, we’re left with an extraordinarily ecstatic ending, a hallucinatory concoction of music, movement, light – and feathers. Swan Lake/Loch na hEala was on at Sadler’s Wells. Click here for more details.